On 24th November 2016 the Bishop of St Albans, Rt Revd Alan Smith, led a short debate in the House of Lords on rural bus services. His opening speech is below, along with the Minister’s response. The speeches of the other eight Peers who took part can be read here. The Lord Bishop of St Albans: To ask Her Majesty’s Government, in the light of research published by the Local Government Association showing that subsidised bus services in England have reduced by more than 12% in the past year, what assessment they have made of the sustainability of rural communities. 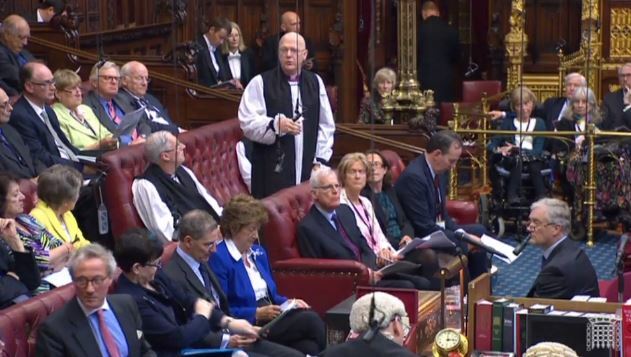 The Lord Bishop of St Albans: My Lords, I thank all noble Lords contributing their considerable expertise to this debate, particularly the noble Lord, Lord Kirkhope, whose wealth of experience is a welcome addition to this House. I declare an interest as president of the Rural Coalition and bishop of a diocese with large rural areas, some of which have seen considerable cuts in bus service provision in recent years. As many noble Lords in this House will know first-hand, rural bus services provide a lifeline for rural communities, creating vital routes of connection to other parts of the country. For anyone who struggles to drive themselves because of age or a disability, or because they do not have a car, buses are often the only means of transport that connects rural residents with work, friends and family. With an increasing number of local services cut from rural towns and larger villages, the need to be able to connect with urban areas only increases. The problem, of course, is that rural bus services are not particularly profitable. Relatively low footfall and long distances between stops mean that rural bus services, particularly in more remote rural areas, require discretionary local council subsidies to maintain viability. As cuts in local authority funding have taken hold over recent years, rural bus routes have been quickly disappearing. Indeed, the rate of this disappearance is startling. Official statistics from the Department for Transport show that bus mileage in local authorities outside London has decreased by 12% in the last year alone. According to the Local Government Association, council-supported bus services in rural areas have decreased by approximately 40% over the past decade. This drop is a direct result of local authority cuts to bus subsidies. Figures collected by the Campaign for Better Transport show that Bedford Borough Council, in my own diocese, has seen an 83% cut in discretionary support for bus services since 2010, while Hertfordshire, also in my diocese, has seen a £1.7 million—or 40%—cut in funding in 2015-16 alone. Across England and Wales, several local councils have decided to cut all discretionary funding for bus services, and some rural towns and villages have found themselves removed from the bus network completely. This situation is completely unacceptable. Rural towns and villages do not exist in self-sustained isolation. As living, breathing communities they depend—like all communities and all people—on interconnection. Whether it is providing care for the elderly, bringing jobs into the local economy, building healthy, diverse and thriving communities, or combating the isolation and loneliness that can be endemic in hard-to-reach places, in such places connectivity is absolutely essential. It is particularly important among the elderly. According to Age UK, 40% of people aged 60 or over use local bus services at least once a week, and around a quarter of these journeys are for medical appointments. When Age UK interviewed elderly residents of rural villages near Durham and Northampton, they found that cuts to rural bus services had severely inhibited their ability to socialise and participate in community life, limited their access to healthcare and left them significantly poorer owing to the higher costs of alternative forms of transport. It is difficult to blame local authorities, however, because cuts to bus service provision are inevitable when local councils continue to see their budgets shrink. It is down to Her Majesty’s Government to ensure that local authorities have the resources they need to adequately support rural communities. One option would be for Her Majesty’s Government to commit to funding the statutory concessionary fares scheme in full. The LGA estimates that £764 million is spent each year by local authorities in fulfilling their statutory obligation to provide concessionary fares, with local councils having to divert money from discretionary bus service funding to make up a shortfall of around £200 million. Full central government funding for the scheme seems a perfectly reasonable suggestion that could free up resources for local authorities to invest in discretionary, but often essential, bus service support. I hope the Minister will assure me that his department will look at that carefully. Of course, we also need to think about the long-term future of the bus network as well as the immediate needs. The Bus Services Bill makes significant changes to the way bus services are regulated, not least through the extension of franchising powers. While this is a welcome step change in the provision of bus services, it must be recognised that the extension of franchising is likely—at least at first—to be confined to predominantly urban areas that have developed a combined mayoral authority. Given the scale of the change involved, I understand the Government’s caution, but I hope that the Minister can indicate at least an aspiration to see franchising powers extended to authorities such as county councils before the end of this Parliament, where it could make a substantial difference to rural bus service provision. As a side note, while on the subject of the Bus Services Bill, I take the opportunity to welcome the Government’s commitment to requiring audible and visual information on all buses. I urge Her Majesty’s Government to ensure that adequate financial assistance with the associated costs is provided to small and medium-sized bus companies, which often operate in rural areas. Given the reliance of disabled people in rural areas on bus services, it would be unacceptable if this commitment were later watered down and smaller bus companies were excused from this requirement. Of course, it is always the case that in some remote areas commercial bus routes will remain unviable in the long term, no matter what support they receive from the local authority. Rural communities themselves need to be willing to think creatively to provide publicly accessible transport. Community transport schemes hold great potential if a joined-up approach can be found, and they offer real opportunities for third sector organisations, including the Church, to get involved in providing an essential local service. Indeed, I was pleased to learn just this week of a church in Harpenden, just up the road from where I live, which has acquired two 17-seater buses and several volunteer bus drivers. It is hoping to start a bus service in February connecting care homes with the wider community. I hope that Her Majesty’s Government continue to commit to projects like the community minibus fund and the Total Transport scheme so that we see this important sector grow and develop in new and innovative ways. In a world of increasing connectivity, rural areas are facing a future of deepening disconnection. Her Majesty’s Government are taking steps in the right direction but local authorities still lack the financial resources they require to connect rural areas with the wider community. Without these resources, we will not be able to build flourishing, sustainable rural communities, and I urge the Government to commit to putting rural bus services on a long-term and sustainable footing. The Parliamentary Under-Secretary of State, Department for Environment, Food and Rural Affairs (Lord Gardiner of Kimble) (Con): My Lords, I am most grateful to the right reverend Prelate for raising this important issue. I also congratulate my noble friend Lord Kirkhope of Harrogate on his excellent maiden speech. I think all your Lordships much appreciate his decision to make it during a rural debate. I declare my rural interests as set out in the register. Rural areas are home to one-fifth of England’s population. They are the source of much of the food we eat, the water we drink, the landscapes we enjoy and the biodiversity we all cherish. This is why well-connected and well-served rural communities are essential, not just for local economies, but for the nation’s prosperity and well-being. Sustainable communities are safe, inclusive places where people want to live and work, and where they act together to provide the facilities they need. They offer quality of life and opportunity, both now and in future. Indeed, the attraction of rural England is evident from the number of people moving from urban areas to the countryside—around 60,000 a year. I agree with what the noble Lord, Lord Greaves, said about interconnection of all parts of the country. It is a very bad idea to be spinning in one’s own orbit. Rural communities in England already make a strong contribution to our economy. They employ 3.8 million people and contribute more than £200 billion to the GDP. A quarter of our businesses are based in rural areas and 85% of rural employees work in SMEs. The announcement in the Autumn Statement to double the rural rate relief to 100% in April next year will give a much-needed boost to businesses in the country. The sustainability of our rural communities also derives from the fact that they are cohesive hubs. They draw social and cultural sustenance from shared values, community spirit, volunteers and institutions such as parish councils, village halls, schools, shops, post offices and churches. Only last weekend I attended two community events: the monthly community cinema in Eye and, the next day, the Wickham Skeith November fair—all, as is usual in the countryside, run by volunteers. As Rural Affairs Minister, I am committed to doing everything I can to help rural communities flourish and enhance their distinctive character and quality of life. Our rural productivity plan last year set out some clear steps to help rural areas achieve their potential. We want to ensure we improve the sustainability of our rural communities even further. We are doing this in a number of ways. Like my noble friend Lady McIntosh, I well understand the importance of broadband and mobile connections for rural users. Indeed, I am sure that I and many of your Lordships share some of the frustrations many country dwellers feel. Everyone can now access basic broadband speeds of 2 megabits per second—fast enough for online access to every government service. Around 92% of UK premises have access to superfast broadband and we are on track to reach 95% by 2017. We are also working on the introduction of a broadband universal service obligation by 2020, at a minimum speed of 10 megabits per second. A broadband universal service obligation aims to provide a safety net for those without access to superfast broadband. Indeed, the industry has guaranteed to extend mobile phone 2G coverage, allowing access to basic voice and text messages, to 90% of the UK landmass by 2017. But we know we need to do much more, and as a member of the digital implementation task force I can assure your Lordships that I am continually making the case for improved rural connectivity. Increasing rural housing stock enables villages to thrive and, I hope, become increasingly prosperous. New, well-designed and affordable homes for families, young people and rural workers help ensure that village services such as schools and shops can continue, and support sustainable rural communities. Indeed, the rural housing scheme I facilitated many years ago at Kimble was driven by the parish council, so I was very interested in what my noble friend Lord Kirkhope of Harrogate had to say on the matter. I encourage local communities to take the initiative to secure the future of their own villages through sensitive development. One way to do this is through making more use of neighbourhood plans in rural areas, which enable communities to have a proper say in where new homes are built and to see the benefits of development. I am working closely with DCLG, and as a member of the housing implementation task force, to ensure that housing policy delivers for rural communities. The Government recognise the importance of public transport for the sustainability and independence of communities. We know how important affordable, accessible transport is for people and fully recognise the extra pressures placed on local authorities throughout the country to provide such services, particularly in more remote areas. The Government also believe that local authorities are best placed to decide what support to provide in response to the needs of local communities. A number of noble Lords, including my noble friend Lord Polak, referred to the Bus Services Bill, which had its Third Reading yesterday. The Bill provides powers that enable local transport authorities to work in partnership with transport providers to ensure that services reflect the needs of local people. The noble Baroness, Lady Jones of Whitchurch, was absolutely right that the needs of local people must come as a priority in looking at what solutions we can bring. The nature of rural areas means that we also need to work across Whitehall to develop innovative solutions to address rural connectivity—I was very struck by what the noble Baroness, Lady Bakewell of Hardington Mandeville, had to say on those challenges. I have discussed many of them with my own officials and colleagues in the Department for Transport. My noble friend Lord Polak and the right reverend Prelate referred to the community minibus fund. The Government have provided almost 200 community transport operators with a free minibus, funded through the £25 million community minibus fund. These provide vital transport services in rural areas across the country. To answer a question about what more we are doing in this regard, I can say that a second round was announced earlier this year. All the feedback that I am receiving tells me that such minibuses are making a big difference. I assure your Lordships that I discuss this matter with my ministerial colleagues because I think that it is a very sound way forward. Total Transport is also finding ways to commission public sector-funded transport more effectively so that passengers receive a better service with less duplication. My notes contain a list of local authorities that are receiving funds, including Somerset and Cornwall. Although I do not have time to go through all the figures, I think that local authorities in almost every area represented by the speakers in today’s debate are receiving funds via Total Transport, which I hope will be helpful. I understand the points made about concessionary travel. The Government provide almost £1 billion of funding for concessionary bus passes ever year and remain committed to the current scheme. In addition, £250 million was paid this year to support bus services in England via the bus services operators grant. Nearly £89 million was paid through the green bus fund, improving the environmental performance of buses. Some £30 million of funding was provided for low-emission buses and associated infrastructure, and a further £150 million for low-emission buses and taxis was announced in this week’s Autumn Statement. More than £200 million was provided through the local growth fund for 15 bus schemes, including new bus stations, rapid transport schemes and bus priority corridors. So considerable funds are going into bus services, but I have taken on board the points that have been made. On concessionary travel, bus operators are reimbursed on the basis that they are no better or worse off for carrying concessionary pass-holders. The Government issue guidance to help local authorities administer the concession consistent with this principle, but I will take back to colleagues in both departments the points that have been made on the matter today. My honourable friend Thérèse Coffey, Minister for Environment and Rural Life Opportunities, is working with other departments to improve access to childcare, education, healthcare and skills—mentioned by a number of your Lordships—in rural areas. I hope that the Government’s plan to offer 30 hours of free childcare to eligible parents of three and four year-olds demonstrates in part our commitment. The Government are also consulting on the access criteria for post offices to ensure that they continue to provide vital postal and banking services to rural communities. “The government will continue to work with the region to create growth and improve life chances for residents across the whole area, ensuring we have the right conditions for rural communities and businesses to thrive”. It is vital in the national interest and for future generations that rural England is in good heart. Rural communities offer so much. Our two 25-year plans for food and farming and the natural environment will demonstrate our commitment to future prosperity. Rural communities have an innate resilience and ability to build on their strengths. I have noted all that has been said today—we could have had a very much longer debate and I hope that there will other opportunities. I am conscious of the challenges facing the countryside, but I look forward to helping those who live in it achieve the undoubted potential of rural areas. For future generations, all our efforts should be concentrated on that purpose.